I am the Chief Technology Officer for Bitstream Foundry LLC, a SharePoint solutions, services, and consulting company headquartered in Cincinnati, Ohio. My professional development background goes back to the COM and pre-COM days - as well as SharePoint (since 2004) - and I've spent a tremendous amount of time both in the plumbing (as an IT Pro) and APIs (as a developer) associated with SharePoint and SharePoint Online. In addition, Microsoft awarded me an MVP (most valuable professional) in 2016 for the Office Servers and Services category. RPO (recovery point objective) targets and RTO (recovery time objective) targets are critical to have in hand prior to the start of disaster recovery (DR) planning for SharePoint. This post discusses RPO and RTO to build an understanding of what they are and how they impact DR decision making. Years ago, before I began working with SharePoint, I spent some time working as an application architect for a Fortune 500 financial services company based here in Cincinnati, Ohio. While at the company, I was awarded the opportunity to serve as a disaster recovery (DR) architect on the team that would build (from ground up) the company’s first DR site implementation. It was a high-profile role with little definition – the kind that can either boost a career or burn it down. Luckily for me, the outcome leaned towards the former. Admittedly, though, I knew very little about DR before starting in that position. I only knew what management had tasked me with doing: ensuring that mission-critical applications would be available and functional at the future DR site in the event of a disaster. If you aren’t overly familiar with DR, then that target probably sounds relatively straightforward. As I began working and researching avenues of attack for my problem set, though, I quickly realized how challenging and unusual disaster recovery planning was as a discipline – particularly for a “technically minded” person like myself. It is the nature of technical people to find and implement technical solutions to technical problems. At its core, disaster recovery is not a technical problem; it is a business problem. Approaching disaster recovery with a purely technical mindset will result in a failure to deliver an appropriate solution more often than not. What do I mean by that? Well, technical personnel tend to lump DR plans and activities into categories like “buying servers,” “taking backups,” and “acquiring off-site space.” These activities can certainly be (and generally are) part of a DR plan, but if they are the starting point for a DR strategy, then problems are likely to arise. Let me explain by way of a simplistic and fictitious example. Consider the plight of Larry. Larry is an IT professional who possesses administrative responsibility for his company’s SharePoint-based intranet. One day, Larry is approached by his manager and instructed to come up with a DR strategy for the SharePoint farm that houses the intranet. Like most SharePoint administrators, Larry’s never really “done” DR before. He’s certain that he will need to review his backup strategy and make sure that he’s getting good backups. He’ll probably need to talk with the database administrators, too, because it’s generally a good idea to make sure that SQL backups are being taken in addition to SharePoint farm (catastrophic) backups. Larry’s been told that off-site space is already being arranged by the facilities group, so that’s something he’ll be able to take off of his plate. He figures he’ll need to order new servers, though. Since the company’s intranet farm consists of four servers (including database servers), he plans to play it safe and order four new servers for the DR site. In his estimation, he’ll probably need to talk with the server team about the hardware they’ll be placing out at the DR site, he’ll need to speak with the networking team about DNS and switching capabilities they plan to include, etc. The off-site DR location will include four servers that are setup and configured as a new, “warm standby” SharePoint farm. Every Sunday night, a full catastrophic backup of the SharePoint farm will be taken; every other night of the week, a differential backup will be taken. After each nightly backup is complete, it will be remotely copied to the off-site DR location. In the event of a disaster, Larry will restore the latest full backup and appropriate differential backups to the standby farm that is running at the DR site. Once the backups have been restored, all content will be available for users to access – hypothetically speaking, of course. There are a multitude of technical questions that aren’t answered in the plan described above. For example, how is patching of the standby farm handled? Is the DR site network a clone of the existing network? Will server name and DNS hostname differences be an issue? What about custom solution packages (WSPs)? Ignoring all the technical questions for a moment, take a step back and ask yourself the question of greatest importance: will Larry’s overall strategy and plan meet his DR requirements? If you’re new to DR, you might say “yes” or “no” based on how you view your own SharePoint farm and your experiences with it. If you’ve previously been involved in DR planning and are being honest, though, you know that you can’t actually answer the question. Neither can Larry or his manager. In fact, no one (on the technical side, anyway) has any idea if the DR strategy is a good one or not – and that’s exactly the point I’m trying to drive home. Let’s be honest: Larry’s DR plan for intranet recovery could be on-the-money. Given all of the variables in DR planning and the assumptions that Larry made, though, the chance of such an outcome is slim. There’s a solid chance that The Business could judge Larry’s DR plan as falling short. Perhaps the intranet houses areas that are highly volatile with critical data that changes frequently throughout the day. If an outage were to occur at 4pm in the afternoon, an entire day’s worth of data would basically be lost because the most recent backup would likely be 12 or so hours old (remember: the DR plan calls for nightly backups). Loss of that data could be exceptionally costly to the organization. At the same time, Larry’s recovery strategy assumes that he has enough time to restore farm-level backups at the off-site location in the event of a disaster. Restoring a full SharePoint farm-level backup (with the potential addition of differential backups) could take hours. If having the intranet down costs the company $100,000 per hour in lost productivity or revenue, you can bet that The Business will not be happy with Larry’s DR plan in its current form. On the flipside, there’s always the chance that Larry’s plan is overkill. If the company’s intranet possesses primarily static content that changes very infrequently and is of relatively low importance, nightly backups and a warm off-site standby SharePoint farm may be overkill. Sure, it’ll certainly allow The Business to get their intranet back in a timely fashion … but at what cost? If a monthly tape backup rotation and a plan to buy hardware in the event of a disaster is all that is required, then Larry’s plan is unnecessarily costly. Money is almost always constrained in DR planning and execution, and most organizations prioritize their DR target systems carefully. Extra money that is spent on server hardware, nightly backups, and maintenance for a warm off-site SharePoint farm could instead be allocated to the DR strategies of other, more important systems. No one wants to be left guessing whether or not their SharePoint DR strategy will adequately address DR needs without going overboard. In approaching the challenge his manager handed him without obtaining any additional input, Larry fell into the same trap that many IT professionals do when confronted with DR: he failed to obtain the quantitative targets that would allow him to determine if his DR plan would meet the needs and expectations established by The Business. In their most basic form, these requirements come in the form of recovery point objectives (RPOs) and recovery time objectives (RTOs). The diagram above simply shows an arbitrary timeline with an event (a “declared disaster”) occurring in the middle of the timeline. 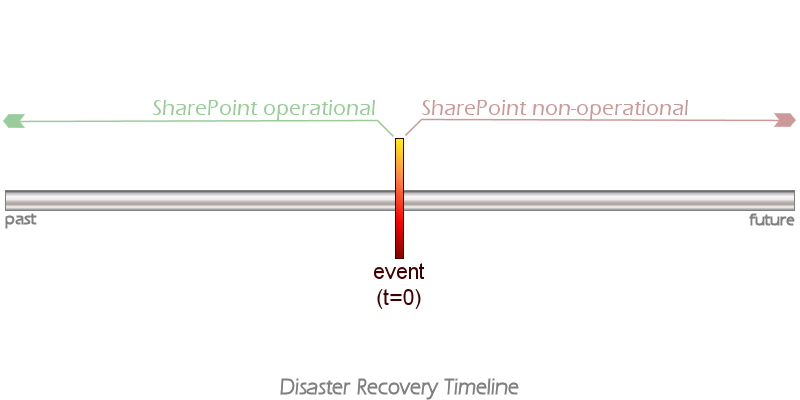 Any DR planning and preparation occurs to the left of the event on the timeline (in the past when SharePoint was still operational), and the actual recovery of SharePoint will happen following the event (that is, to the right of the event on the timeline in the “non-operational” period). This DR timeline will become the canvas for further discussion of the first quantitative DR target you need to obtain before you can begin planning a SharePoint DR strategy: RPO. As stated a little earlier, RPO is an acronym for Recovery Point Objective. Though some find the description distasteful, the easiest way to describe RPO is this: it’s the maximum amount of data loss that’s tolerated in the event of a disaster. RPO targets vary wildly depending on volatility and criticality of the data stored within the SharePoint farm. Let’s add a couple of RPO targets to the DR timeline and discuss them a bit further. Two RPO targets have been added to the timeline: RPO1 and RPO2. As discussed, each of these targets marks a point in the past from which data must be recoverable in the event of a disaster. In the case of our first example, RPO1, the point in question is 48 hours before a declared disaster (that is, “we have a 48 hour RPO”). RPO2, on the other hand, is a point in time that is a mere 30 minutes prior to the disaster event (or a “30 minute target RPO”). At a minimum, any DR plan that is implemented must ensure that all of the data prior to the point in time denoted by the selected RPO can be recovered in the event of a disaster. For RPO1, there may be some loss of data that was manipulated in the 48 hours prior to the disaster, but all data older than 48 hours will be recovered in a consistent state. RPO2 is more stringent and leaves less wiggle room; all data older than 30 minutes is guaranteed to be available and consistent following recovery. If you think about it for a couple of minutes, you can easily begin to see how RPO targets will quickly validate or rule-out varying backup and/or data protection strategies. In the case of RPO1, we’re “allowed” to lose up to two days (48 hours) worth of data. In this situation, a nightly backup strategy would be more than adequate to meet the RPO target, since a nightly backup rotation guarantees that available backup data is never more than 24 hours old. Whether disk or tape based, this type of backup approach is very common in the world of server management. It’s also relatively inexpensive. The same nightly backup strategy would fail to meet the RPO requirement expressed by RPO2, though. RPO2 states that we cannot lose more than 30 minutes of data. With this type of RPO, most standard disk and tape-based backup strategies will fall short of meeting the target. To meet RPO2’s 30 minute target, we’d probably need to look at something like SQL Server log shipping or mirroring. Such a strategy is going to generally require a greater investment in database hardware, storage, and licensing. Technical complexity also goes up relative to the aforementioned nightly backup routine. It’s not too hard to see that as the RPO window becomes increasingly more narrow and approaches zero (that is, an RPO target of real-time failover with no data loss permitted), the cost and complexity of an acceptable DR data protection strategy climbs dramatically. 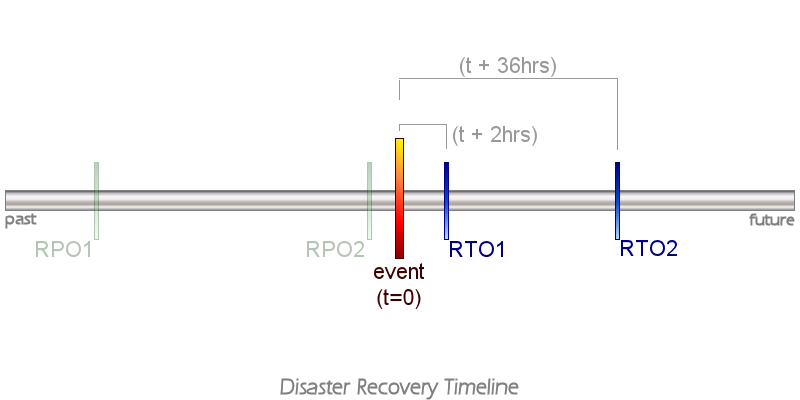 If RPO drives how SharePoint data protection should be approached prior to a disaster, RTO (or Recovery Time Objective) denotes the timeline within which post-disaster farm and data recovery must be completed. To illustrate, let’s turn once again to the DR timeline. As with the previous RPO example, we now have two RTO targets on the timeline: RTO1 and RTO2. 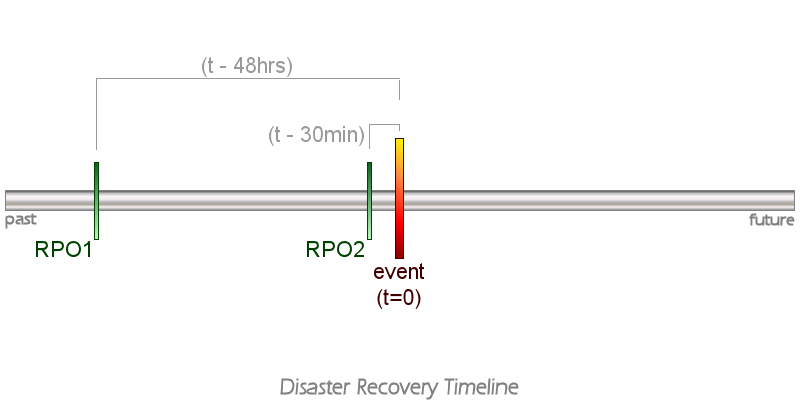 Analogous to the RPO targets, the RTO targets are given in units of time relative to the disaster event. In the case of RTO1, the point in time in question is two hours after a disaster has been declared. RTO2 is designated as t+36 hours, or a day and a half after the disaster has been declared. In plain English, an RTO target is the maximum amount of time that the recovery of data and functionality can take following a disaster event. If the overall DR plan for your SharePoint farm were to have an RTO that matches RTO2, for instance, you would need to have functionality restored (at an agreed-upon level) within a day and half. If you were operating with a target that matches RTO1, you would have significantly less time to get everything “up and running” – only two hours. RTO targets vary for the same reasons that RPO targets vary. If the data that is stored within SharePoint is highly critical to business operations, then RTOs are generally going to trend towards hours, minutes, or maybe even real-time (that is, an RTO that mandates transferring to a hot standby farm or “mirrored” data center for zero recovery time and no interruption in service). For SharePoint data and farms that are less business critical (maybe a publishing site that contains “nice to have” information), RTOs could be days or even weeks. Just like an aggressive RPO target, an aggressive RTO target is going to limit the number of viable recovery options that can possibly address it – and those options are generally going to lean towards being more expensive and technically more complex. For example, attempting to meet a two hour RTO (RTO1) by restoring a farm from backup tapes is going to be a gamble. With very little data, it may be possible … but you wouldn’t know until you actually tried with a representative backup. At the other extreme, an RTO that is measured in weeks could actually make a ground-up farm rebuild (complete with new hardware acquisition following the disaster) a viable – and rather inexpensive (in up-front capital) – recovery strategy. Whether or not a specific recovery strategy will meet RTO targets in advance of a disaster is oftentimes difficult to determine without actually testing it. That’s where the value of simulated disasters and recovery exercises come into play – but that’s another topic for another time. This post was intended to highlight a common pitfall affecting not only SharePoint DR planning, but DR planning in general. It should be clear by now that I deliberately avoided technical questions and issues to focus on making my point about planning. Don’t interpret my “non-discussion” of technical topics to mean that I think that their place with regard to SharePoint DR is secondary. That’s not the case at all; the fact that John Ferringer and I wrote a book on the topic (the “SharePoint 2007 Disaster Recovery Guide”) should be proof of this. It should probably come as no surprise that I recommend our book for a much more holistic treatment of SharePoint DR – complete with technical detail. There are also a large number of technical resources for SharePoint disaster recovery online, and the bulk of them have their strong and weak points. My only criticism of them in general is that they equate “disaster recovery” to “backup/restore.” While the two are interrelated, the latter is but only one aspect of the former. As I hope this post points out, true disaster recovery planning begins with dialog and objective targets – not server orders and backup schedules. If you conclude your reading holding onto only one point from this post, let it be this: don’t attempt DR until you have RPOs and RTOs in hand! This post investigates BLOB caching within MOSS and includes a discussion of how the BLOB cache is internally implemented, how flushing operations are carried out, and the differences between single-server (UI) and farm-wide flushes. Most publishing site administrators have at least some degree of familiarity with the binary large object (BLOB) cache that is supplied by the MOSS platform, but trying to find information describing how it actually works its magic can be tough. This post is an attempt to shed a bit of light on the structure, implementation, and operations of the BLOB cache. Before going too far, though, I should apologize to the group Motorcycle for twisting the title and lyrics of one of their more popular trance songs (“As The Rush Comes”) for the purpose of this post. I guess I simply couldn’t resist the opportunity to have a little (slightly juvenile) fun. What is the MOSS BLOB Cache? Also known as disk-based caching, BLOB caching is one of the three forms of caching supplied/supported by MOSS (not WSS) out-of-the-box (OOTB). Simply put, the BLOB cache is a mechanism that allows MOSS to locally store “larger” list items (images, CSS, and more) within the file system of web front-ends (WFEs) so that these resources can be served to callers more efficiently than round-tripping to the content database each time a request for such a resource is received. The rest of this post assumes that you’re familiar with the basics of the MOSS BLOB cache. If you aren’t, I’d recommend checking out MSDN (“Caching In Office SharePoint 2007”) for a primer. Before discussing how flushes are carried out, it’s worth spending a few minutes talking about the internals of the BLOB cache. Having an understanding of what’s going on “under the hood” helps when explaining some of peculiarities I’ll be describing a little later in this post. The MOSS BLOB caching mechanism is implemented primarily with the help of two types (classes) that live within the Microsoft.SharePoint.Publishing namespace: the BlobCache type and its associated BlobCacheEntry type. Each BlobCache object possesses a dictionary that houses BlobCacheEntry instances, and each BlobCacheEntry object represents an SPListItem (SharePoint list item) object that is being stored (cached) in the local file system of the server. As shown, BLOB caching is disabled by default. Since BLOB caching is enabled and disabled via the web.config file, configuration and “awareness of operation” is largely a manual affair. From within the SharePoint browser UI, it cannot be easily determined if BLOB caching is enabled or disabled in the same way that this information can be determined for page output caching and object caching. This leads to another point that is also worth mentioning: though an Internet Information Services (IIS) web site and a SharePoint web application are fairly synonymous in the case of a single zone web application, the one-to-one equivalence breaks down when a web application is extended to multiple zones from within Central Administration. In such an extended scenario, each zone (Default, Internet, Intranet, Extranet, and Custom) has its own IIS web site with its own web.config, so it is possible that BLOB caching can be both enabled and disabled for site collections being exposed. The URL used to access a site collection becomes important in this scenario. The site’s web.config configuration settings for the BLOB cache get read and processed. Assuming settings are found, the PublishingHttpModule creates a new BlobCache object instance to service the (IIS) web site. This happens whether or not BLOB caching is actually enabled. Put another way: all sites for which the PublishingHttpModule is active have a BlobCache object “assigned” to them whether that object is in use (enabled) or not. The BlobCache instance takes care of a number of startup housekeeping items like computing file paths, setting up internal dictionaries, and ensuring that a consistent and ready state is established to facilitate requests. Assuming all settings are consistent and valid, the BlobCache object instance registers itself with the hosting environment; it then spins-up a separate (independent) thread to rehydrate saved settings (for cached objects), create indexes, and perform some additional startup activities. This “maintenance thread” then stays alive to regularly perform background checks for things like flush requests, site changes, etc. – but only if BLOB caching is enabled within the web.config. If BLOB caching isn’t enabled, no additional work is performed on the thread. Finally, the BlobCache instance’s RewriteUrl method is registered as a handler for the AuthorizeRequest method of the SharePoint application (HttpApplication) for which the pipeline was established. Since the AuthorizeRequest method fires for each SharePoint web request prior to actual page processing, it gives the BlobCache instance a chance to inspect a requested URL and possibly do something with it – such as serve an object back from the disk-based BLOB cache instead of allowing the request to proceed through “normal channels” (which may involve database object lookup). At the end of this process, a BlobCache object exists for all publishing sites (that is, sites where the PublishingHttpModule is active). Again, this happens whether or not BLOB caching is actually enabled for the IIS site … though the BlobCache instance will only process requests (that is, perform useful actions in the RewriteUrl method) if it has been enabled to do so via the appropriate web.config setting. Within the E:\MOSS\BLOBCache folder are two subfolders named 748546212 and 1553899298. Each of these folders houses BLOB cache content for a different IIS site; each web site for which BLOB caching is enabled ends up with its own folder. The folder names (for example, 748546212) are nothing more than each web site’s ID value as assigned by IIS. These ID values are readily visible within the Internet Information Manager (IIS) Manager snap-in, making it easy to correlate folders with their associated IIS web sites. change.bin: This file contains serialized change tokens (SPChangeToken) for objects being cached in the local file system. These tokens allow the BlobCache maintenance thread to query the content source(s) and subsequently update the contents of the BLOB cache with any items that are identified as having changed since the last maintenance sweep. dump.bin: This file contains a serialized copy of the BlobCache’s cache dictionary. The dictionary maintains information for all objects being tracked and maintained by the BlobCache object; each key/value pair in the dictionary consists of a local file path (key) and it’s associated BlobCacheEntry (value). flushcount.bin: This file contains nothing more than the serialized value of the cacheFlushCount for the BlobCache object. Practically speaking, this value allows a BlobCache to determine if a flush has been requested while it was shutdown. In a properly functioning BLOB cache, these three .bin files will always be present. If any of these files should become corrupt or be deleted, the BlobCache will execute a flush to remedy its inconsistent state. In a site where web requests have been processed and files have been cached, additional folders and files will be present in addition to the change.bin, dump.bin, and flushcount.bin files. Additional folders (and subfolders) reflect the URL path hierarchy of the site being serviced by the BlobCache object. The files within these (path) folders correspond one-to-one with list items (that is, BLOB assets) that have been requested, and the cached files themselves have the same name as their corresponding list items with the addition of a .cache extension. the BLOB cache folder servicing the http://www.myurl.com site within the server’s file system will have a subfolder within it named PUBLISHINGIMAGES. The PUBLISHINGIMAGES subfolder will have a file named TEST.JPEG.cache. Small side note which may be evident: the BlobCache object creates all cache-resident paths and filenames (save for the .cache extension) in uppercase. What Are the Mechanics of a Flush? The BlobCache acquires a writer lock for its working folder to prevent other operations during the flush that’s about to be conducted. The BlobCache attempts to move it’s working folder to a temporary location – a new folder identified by a freshly generated globally unique identifier (GUID) string – in preparation for the flush. If the previous folder move (to the temporary “GUID folder”) succeeded, the BlobCache attempts to delete the temporary folder. If the previous move attempt failed, the BlobCache attempts an in-place deletion of the working folder. If the folder deletion attempt fails, the BlobCache waits two seconds before attempting the folder deletion operation once again. If the deletion fails a second time, the BlobCache leaves the temporary folder (or the original folder if the folder move failed in step #2) alone and proceeds. The BlobCache performs internal housekeeping to clean up dictionaries, reset tracking variables, create a new BLOB cache subfolder (again, folder name is derived from the IIS site ID), and write out a new set of state files (change.bin, dump.bin, and flushcount.bin) to the folder. With everything cleaned-up and ready to go, the BlobCache releases its Mutex writer lock and normal operations resume. A single-server flush can be requested from within the SharePoint browser UI via the Site Collection Administration column’s “Site collection object cache” link. A farm-wide flush can be requested via STSADM.exe (note the qualifiers supplied by Maxime Bombardier at the bottom of the page) or with the help of a third-party tool like my MOSS 2007 Farm-Wide BLOB Cache Flushing Solution. A request that is made through the ObjectCacheSettings.aspx page results in a direct call to the BlobCache object servicing the associated IIS site (and working folder) on the server receiving the postback (flush) request. Once the FlushCache call is made, the BlobCache carries out the flush as previously described. A farm-wide flush is executed by incrementing a custom property value (named blobcacheflushcount) on the target site collection’s parent SPWebApplication. A change in this property value propagates to all servers since the affected SPWebApplication.Properties collection is updated and maintained in the SharePoint farm configuration database. Each BlobCache object servicing a site collection under the affected SPWebApplication picks up the property change and carries out a flush on the working folder it is responsible for managing. As you might expect, the choice of flush request mechanism (single-server versus farm-wide) has a profound effect on what actually happens during the flush process. Each of the aforementioned IIS web sites is represented by circled numbers 1 through 4 in the diagram above, while the configuration database is represented by a circled number 5; I’ll be referring to these (numbers) in the descriptions that follow. Pay attention, too, to the IDs for each of the two IIS sites on each server (748546212 for the Internet zone and 1553899298 for the default zone). As you can see, the BLOB cache folders for both IIS sites on MOSSWFE1 (that is, #1 and #2 in the previous farm diagram) have cached items in them. The http://www.samplesite.com (#1) site has a “MISCELLANEOUS SHOTS” subfolder (which will have one or more cached resources in it), and the internal.samplesite.com site (#2) has a “BRIAN HEATHERS WEDDING” subfolder (also with cached resources). Notice that the “BRIAN HEATHERS WEDDING” subfolder is gone from the site with ID 1553899298 (internal.samplesite.com, or #2). Further examination of the folder would also confirm that all .bin files had been reset – a clear sign that a flush had taken place. The cache folder for the other site at 748546212 (http://www.samplesite.com, or #1), on the other hand, remains unchanged. Each of the BLOB cache folders (#3 and #4) on MOSSWFE2 also remain unaffected. 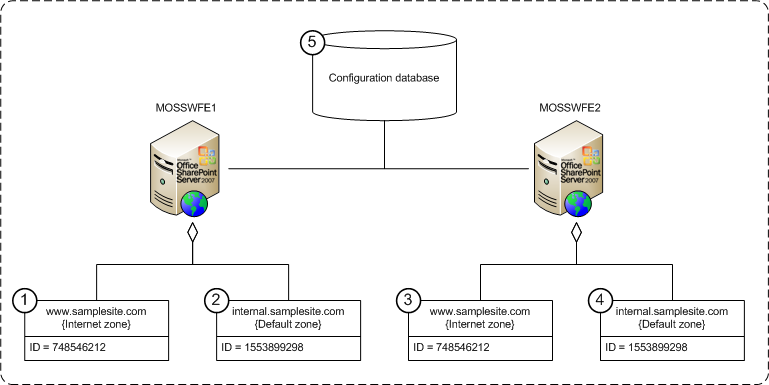 A single-server flush, therefore, is not only restricted to a single server (MOSSWFE1 in this example), but it also impacts only the specific IIS site (or SharePoint zone) through which the flush request is made. In the case of the example above, a site administrator requesting a BLOB cache flush through http://internal.samplesite.com has no impact whatsoever on any of the cached files for http://www.samplesite.com. This can have significant implications in many Internet publishing scenarios where publicly facing sites (zones) only permit anonymous access for security reasons. In such situations, no OOTB mechanism exists to actually permit a flush request for the public zone/site given that such a flush is a privileged operation available only to site collection administrators. In a farm-wide flush, the point of origin for the change that initiates a flush is #5 – the farm configuration database. As described earlier in this post, the blobcacheflushcount property on the SPWebApplication (web application) that houses the target site collection (in the case of the BlobCacheFarmFlush solution) is incremented. When the property is incremented, the BlobCache instances servicing the IIS sites under the SPWebApplication detect the property value change and carry out a flush. A review of MOSSWFE1 would reveal the same file system changes; BLOB cache folders for #1 and #2 would also be reset. Unlike the single-server BLOB cache flush via the SharePoint browser UI, a farm-wide flush impacts all WFEs in the farm serving up the site collection. Arguably the more important (and non-obvious) difference, though, is that the farm-wide flush impacts all zones/IIS sites for the web application serving the site collection. In the case of the example above, a farm-wide flush request through any of the available URLs on either server results in BLOB caches for #1, #2, #3, and #4 being flushed. This tends to make a farm-wide flush the preferred flush mechanism for the publishing site example I cited earlier (where public access occurs through an anonymous-only zone/site). There is one additional point that should be made with regard to farm-wide flushes. In order for a flush to take place on a WFE, the IIS application pool servicing the targeted web application must be running. If the application pool isn’t running (hasn’t yet been started or perhaps has shutdown due lack of requests), it will appear that the flush had “no affect” on the server. The reason for this is relatively straightforward. As described towards the beginning of this post, BlobCache object instances and their associated maintenance threads are created when IIS establishes a SharePoint pipeline (and SPHttpApplication) for request processing. If this pipeline isn’t yet ready to service requests for a targeted web application (perhaps because the IIS worker process hasn’t started-up or the application pool was recycled but not “primed”), then the SPWebApplication’s blobcacheflushcount property change won’t be detected at the time it is altered. No maintenance thread = no property change detection = no flush. Since the cacheFlushCount for each BLOB cache is serialized and tracked via the flushcount.bin file, though, detection of the web application’s flush property value change occurs as soon as the BlobCache object is instantiated at the time of pipeline setup. The result is that a BLOB cache flush occurs as soon as the worker process or new application domain (and by extension, the BlobCache instance and its maintenance thread) spins-up to begin servicing requests. It is my hope that this overview provides you with some insight into the internals of the MOSS BLOB cache, as well as a basis for understanding how flush mechanisms differ. As always, I welcome any feedback or questions you might have. This post explores the SPWebService’s ApplyApplicationContentToLocalServer method, the constraints one faces when using it, and an alternative to its use when updating application page sitemap files. Caching capabilities that are available (or exposed) through MOSS are something I spend a fair number of working hours focusing on. MOSS publishing farms can make use of quite a few caching options, and wise administrators find ways to leverage them all for maximum scalability and performance. While helping a client work through some performance and scalability issues recently, I ran into some annoying problems with disk-based caching – also known as BLOB (Binary Large OBject) caching. These problems inspired me to create the BlobCacheFarmFlush solution that I’ve shared on CodePlex, and it was during the creation of this solution that I wrangled with the ApplyApplicationContentToLocalServer method. The BlobCacheFarmFlush solution itself has a handful of moving parts, and the element I’m going to focus on in this post is the administration page (BlobCacheFarmFlush.aspx) that gets added to the farm upon Feature activation. In particular, I want to share some of the lessons I learned while figuring out how to get the page’s navigational (breadcrumb) support operating properly. Unless additional steps are taken during the installation of your application pages (beyond simply placing them in the LAYOUTS folder), breadcrumbs like the one shown above will not appear. It’s not that application pages (which derive from LayoutsBasePage or UnsecuredLayoutsBasePage) don’t include support for breadcrumbs – they do. The reason breadcrumbs fail to show is because the newly added application pages themselves are not integrated into the sitemap files that describe the navigational hierarchy of the layouts pages. Getting breadcrumbs to appear in your own application pages requires that you update the layouts sitemap files for each of the (IIS) sites serving up content on each of the SharePoint web front-end (WFE) servers in your farm. The files to which I’m referring are named layouts.sitemap and appear in the _app_bin folder of each IIS site folder on the WFE. An example of one such file (in its _app_bin folder) appears below. Create a layouts.sitemap. *.xml file that contains your sitemap navigation additions and deploy it to the LAYOUTS folder within SharePoint’s 12 hive on a server. This isn’t much code, and it’s pretty clear that the magic rests with the ApplyApplicationContentToLocalServer method. This method carries out a few operations, but the one in which we’re interested involves taking the new navigation nodes in the layouts.sitemap. *.xml file and integrating them into the layouts.sitemap file for each IIS site residing under a target SPWebService instance. With the new nodes (which tie the new application pages into the navigational hierarchy) present within each layouts.sitemap file, breadcrumbs appear at the top of the new application pages when they are rendered. I took this approach for a spin, and everything looked great! My sitemap additions were integrated as expected, and my breadcrumb appeared on the BlobCacheFarmFlush.aspx page. All was well .. until I actually deployed my solution to its first multi-server SharePoint environment. That’s when I encountered my first problem. When I installed and activated the BlobCacheFarmFlush solution in a multi-server environment, the breadcrumbs failed to appear on my application page. It took a little legwork, but I discovered that the ApplyApplicationContentToLocalServer method has “Local” in its name for a reason: the changes made through the method’s actions only impact the server on which the method is invoked. This contrasts with the behavior that SharePoint objects commonly exhibit. The changes that are made through (and to) many SharePoint types impact data that is actually stored in SQL Server, and changes made through any farm member get persisted back to the appropriate database and become available through all servers within the farm. The ApplyApplicationContentToLocalServer method, on the other hand, carries out its operations directly against the files and folders of the server on which the method is called, and the changes that are made do not “automagically” appear on or through other farm members. The Central Administration host server for the farm in which I was activating my Feature wasn’t one of the WFEs serving up my application page. When I activated my Feature from within Central Admin, my navigation additions were incorporated into the affected sites on the local (Central Admin) host … but the WFEs serving up actual site pages (and my application page) were not updated. Result: no breadcrumb on my application page. This issue is one of those problems that wouldn’t normally be discovered in a typical development environment. Most of the SharePoint developers I know do their work within a virtual machine (VM) of some sort, so it’s not until one moves out of such an environment and into a multi-server environment that this type of deployment problem even makes itself known. This issue only serves to underscore how important it is to test Features and solutions in a typical target deployment environment before releasing them for general use. Putting my thinking cap back on, I worked to come up with another way to integrate the sitemap changes I needed in a way that was multi-server friendly. The ApplyApplicationContentToLocalServer method still seemed like a winner given all that it did for a single line of code; perhaps all I needed to do was create and run a one-time custom timer job (that is, schedule a custom SPJobDefinition subclass) on each server within the farm and have that timer job execute the ApplyApplicationContentToLocalServer method locally. I whipped-up a custom timer job to carry out this action and took it for a spin. That’s when I ran into my second problem. Only local administrators can call this method. Prior to the creation of the custom timer job that I was going to use to update the sitemap files on each of the WFEs, I had basically ignored this point. The local administrator requirement quickly became a barricade for my custom timer job, though. Timer jobs, both SharePoint-supplied and custom, are executed within the context of the SharePoint Timer Service (OWSTIMER.EXE). The Timer Service runs in an elevated security context with regard to the SharePoint farm, but its privileges shouldn’t extend beyond the workings of SharePoint. Though some SharePoint administrators mistakenly believe that the Timer Service account (also known as the “database access account” or “farm service account”) requires local administrator rights on each server within the SharePoint farm, Microsoft spells out that this is neither required nor recommended. This revelation told me that the ApplyApplicationContentToLocalServer method simply wasn’t going to cut the mustard for my purposes unless I wanted to either (a) require that the Timer Service account be added to the Local Administrators group on each server in the farm, or (b) require that an administrator manually execute an STSADM command or custom command line application to carry out the method call. Neither of these were acceptable to me. Since I couldn’t use the ApplyApplicationContentToLocalServer method directly, I wanted to dissect it to the extent that I could in order to build my own process in a manner that replicated the method’s actions as closely as possible. Performing the dissection (again via Reflector), I discovered that the method was basically iterating through each SPIisWebSite in each SPWebApplication within the SPWebService object being targeted. As implied by its type name, each SPIisWebSite represents a web site within IIS – so each SPIisWebSite maps to a physical web site folder within the file system at C:\Inetpub\wwwroot\wss\VirtualDirectories (by default if IIS folders haven’t been redirected). Once each of the web site folder paths is known, it isn’t hard to drill down a bit further to each layouts.sitemap file within the _app_bin folder for a given IIS web site. With the fully qualified path to each layouts.sitemap file computed, it’s possible to carry out a programmatic XML merge with the new sitemap data from a layouts.sitemap. *.xml file that is deployed with a custom Feature or solution. The ApplyApplicationContentToLocalServer method carries out such a merge through the private (and obfuscated) MergeAspSiteMapFiles method of the SPAspSiteMapFile internal type, but only after it has created a backup copy of the current layouts.sitemap file using the SPAspSiteMapFile.Copy method. With an understanding of the process that is carried out within the ApplyApplicationContentToLocalServer method, I proceeded to create my own class that effectively executed the same set of steps. The result was the UpdateLayoutsSitemapTimerJob custom timer job definition that is part of my BlobCacheFarmFlush solution. This class mimics the enumeration of SPWebApplication and SPIisWebSite objects, the backup of affected layouts.sitemap files, and the subsequent XML sitemap merge of the ApplyApplicationContentToLocalServer method. The class is without external dependencies (beyond the SharePoint object model), and it is reusable in its current form. Simply drop the class into a SharePoint project and call its DeployUpdateTimerJobs static method with the proper parameters – typically from the FeatureActivated method of a custom SPFeatureReceiver. The class then takes care of provisioning a timer job instance that will update the layouts.sitemap navigational hierarchy for affected sites on each of the servers within the farm. As an aside: while putting together the UpdateLayoutsSitemapTimerJob, there were times when I thought I had to be missing something. On a handful of occasions, I found myself thinking, “Certainly there had to be a multi-server friendly version of the ApplyApplicationContentToLocalServer method.” When I didn’t find one (after much searching), I had the good fortune of stumbling upon Vincent Rothwell’s “Configuring the breadcrumb for pages in _layouts” blog post. Vincent’s post predates my own by a hefty two and a half years, but in it he describes a process that is very similar to the one I eventually ended up implementing in my custom timer job. Seeing his post helped me realize I wasn’t losing my mind and that I was on the right track. Thank you, Vincent. I can sum up the contents of this post pretty simply: when developing application pages that entail sitemap updates, avoid using the ApplyApplicationContentToLocalServer method unless you’re (a) certain that your Feature will be installed into single server environments only, or (b) willing to direct those doing the installation and activation to carry out some follow-up administration on each WFE in the SharePoint farm. Why does the ApplyApplicationContentToLocalServer method exist? I did some thinking, and my guess is that it is leveraged primarily when service packs, hotfixes, and other additions are configured via the SharePoint Products and Technologies Configuration Wizard. Anytime a SharePoint farm is updated with a patch or hotfix, the wizard is run on each server by a local administrator. An examination of the LAYOUTS folder on one of my farm members provided some indirect support for this notion. In my LAYOUTS folder, I found the layouts.sitemap.search.xml file, and it was dated 3/25/2008. I believe (I’m not positive) that this file was deployed with the SharePoint Infrastructure Updates in the middle of 2008, and those updates introduced a number of new search admin pages for MOSS. Since the contents of the layouts.sitemap.search.xml file include quite a few new search-related navigation nodes, my guess is that the ApplyApplicationContentToLocalServer method was leveraged to merge the navigation nodes for the new search pages when the configuration wizard was run. In the meantime, if you happen to find a way to use this method in a multi-server deployment scenario that doesn’t involve the configuration wizard, I’d love to hear about it! The caveat, of course, is that it has to be a best-practices approach – no security changes, no extra manual work/steps for farm administrators, etc. SharePointInterface.com gets started with a statement of intention and some ground rules. When software architects and developers are relatively certain of the behaviors they desire from their code, but uncertain of how those behaviors should be implemented concretely, it is common to begin with the creation of one or more interfaces. An interface serves as the contract between the consumer and the behind-the-scenes implementation. It’s a time-tested and proven way of moving forward when many details are still unknown. In a weird sort of way, this first post adheres to the pattern just described. 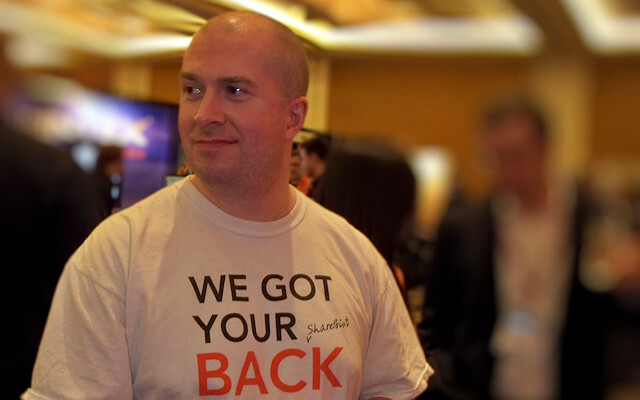 As I describe in my About section, this blog is an attempt to give something back to the SharePoint community and those within it who have contributed so much of their time, expertise, and insight to “the cause.” The details of how this blog will evolve are the subject of speculation (at least by me if no one else), but I do know that I have plenty to share. In addition to the standard SharePoint fare that most of us SharePoint professionals wrangle with on a daily basis, I have done some diving in areas of SharePoint that I haven’t (at the time of writing this) seen covered anywhere. The trick, then, becomes discussing those topics in sufficient depth and in a timely fashion. Those who know me well will tell you that I can be rather critical of certain portions of online SharePoint content. 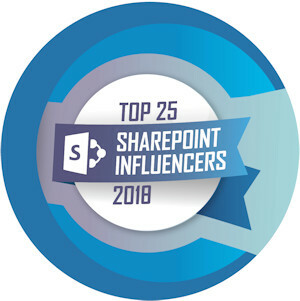 Don’t get me wrong: there are some fantastic bloggers and professionals operating in the SharePoint space, and I (and others) have learned a great deal from these generous folks. At the same time, the SharePoint blogosphere is filled with more than its fair share of posters who blatantly copy the well-written posts of others, admins who report “solutions” with limited (or no) understanding of the problems they’re supposedly solving, junior developers who post sample code or advice that may work but generates even greater (potentially unseen) issues, and people who do nothing more than link to other posts (with no value added) in the hopes of boosting rankings. First and foremost, I believe in giving credit where credit is due. I’m not in the habit of repackaging information others have made available through their own blogs, but in the event that I leverage or incorporate materials I picked up elsewhere, I’ll cite sources and link to them. I’m also inclined to drop the author(s) a note to let them know that I’ve cited their work. In the event that I propose a solution to a problem, I’ll also do my best to explain my understanding of the problem and the factors contributing to it. Where there are gaps in my knowledge (that I’m aware of), I’ll clearly state them. In short: I’ll do what I can to provide a thorough analysis and perform due diligence. If I supply code, it will be documented and written to best practice standards as I understand them. If there are watch-outs or factors that should be considered before implementing the code, I’ll state them. In the event that an outside post or topic becomes the focus of one of my own, I’ll make every attempt to add value beyond simply linking to it. Some posts may not warrant much additional verbage (because they’re highly important in and of themselves), but I hope to be able to provide additional insight and personal tie-in points in most cases. While this post was needed (by my reckoning) to establish some ground rules, it obviously came up short on SharePoint content. My next post should be coming within a week or so and will remedy this. Stay tuned! The SharePoint Interface Blog at WordPress.com.